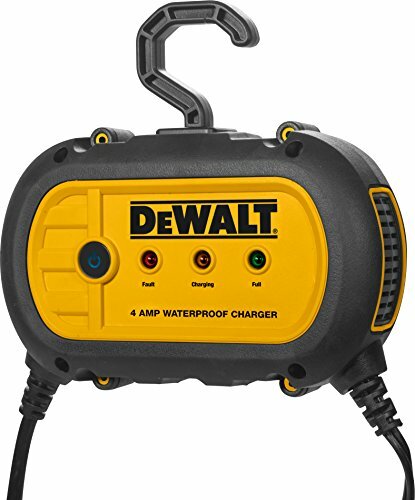 The DEWALT DXAEWPC4 professional 4 amp battery charger/maintainer features a robust waterproof design and waterproof connectors, making this the ideal charger even in the most challenging environments. It's perfect for motorhomes, boats, jet skis, lawn tractors, ATVs, snowmobiles, and vehicles that sit idle for months at a time. It features an IP67 rating which certifies a completely sealed, waterproof and dust proof housing capable of withstanding direct water or rain exposure. This unit maintains battery charge in stored vehicles and features 3 ways to connect: 12V DC accessory plug, heavy duty powder coated battery clamps, or battery terminal rings. The DEWALT DXAEWPC4 professional 4 amp charger/maintainer is fully automatic and incorporates true high frequency technology, to deliver and maintain the charge in any AGM, GEL, or WET automotive or marine 12V battery. It offers built-in circuit protection guards against overcharging, reverse polarity, and short circuiting. It's equipped with mounting holes and a detachable 360 degree rotating hook. California Energy Commission (CEC) compliant and ETL Certified for performance and safety.